Today I have decided to give myself a challenge. I am currently in the middle of a personal financial crises don't be so dramatic Fiona and as such the ability to spend money on clothes is ZILCH/NOTHING/NADA/NOT A PENNY. I have a lot of clothes already, I believe it would equate to 3 triple wardrobes if I put it all together (it's currently in about 4 wardrobes all over the house). Therefore, I am going to make what I already own WORK for me. It will force me to wear things I've forgotten about, saving for best and make me think more about what I do have, not what I do not have. Today is the first day and already indecision's are afoot - scarf or necklace? Could you NOT buy anything for a long period of time? I am going to aim for (don't hold me to it!) 6 months - EEK and YIKES! Instead, I will show you how to get the most from your wardrobe on a daily basis covering all occassions. Blimey Fiona that's quite a challenge....six months is a long time!!! 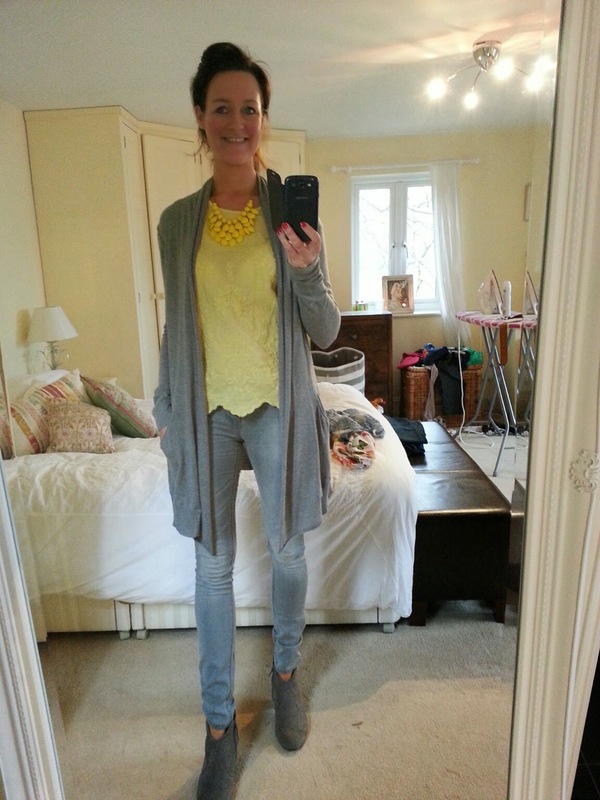 Loving your outfit from today, I love grey teamed with yellow just a gorgeous colour combination. I think I should have said 1 month and then add month on month to see how long I go - 6 months will take me to September - EEK!!!!!!!!!!!!!!!!!!!!!!!!!! I did 5 months a couple of years ago and I'm far more creative now! 6 months!! That is a long time Fiona!! Good luck though, that is one hell of a challenge! I have already eBayed stuff to make way for some new....although looks as though Royal Mail are scuppering my plans to make any money out of doing that they've put postage up!! Scoundrels!! I haven't ever challenged myself to do anything before so it seems now is my time as my hand is being forced (bloody tax bill!). Do not get me started on Royal Mail and post increases!!! I have done 5 months before no wearing the same outfit twice but that didn't involve not buying! This will be hard but I'm thinking of all the money I'll save! Oooh maybe I should!!!!! Alas no, 6 months from here! I will try my hardest but it's going to be hard! cough cough I have already bought the shop stuff so it's not buying but stealing! 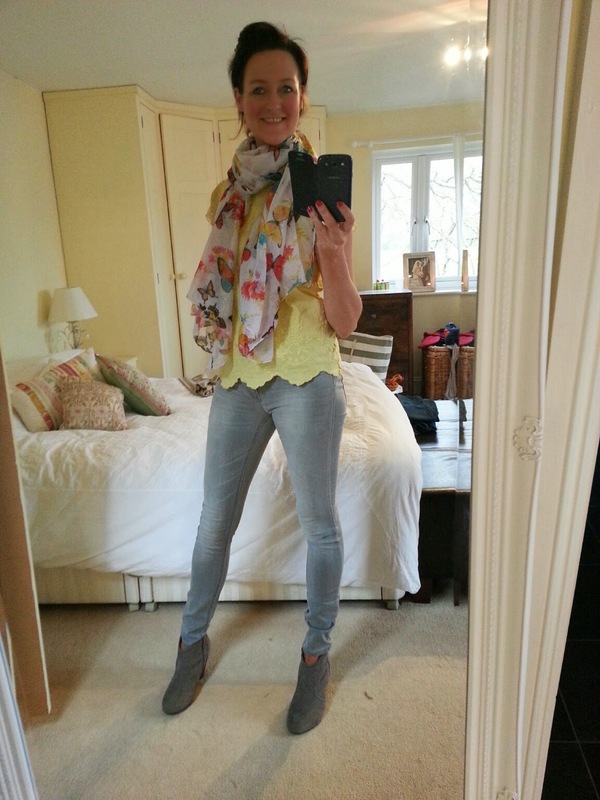 Oh I LOVE it with the scarf - just yellow and grey perfect! You know I could wear my wardrobe for a couple of years without buying anything lol - I have a problem! I am addressing my problem head on but regretting it and I'm only 1 day in! Kind of regretting the 6 month thing now!!!!! I never do anything in terms of pushing myself so this one will be good and it will push me. I'm also happy to fail and admit it! Good luck Fiona..I need to try that as well. I think I might go back and edit this post so it says 2 months!!!!!!!!!!!!!!!!!!!!!!!!!!!!!!!!!!!!!!!!!!!!!!!! Thank you Andrea! I am excited already for the season ahead!